After the dissolution of the Soviet Union, Armenia and Azerbaijan have been waging war on the disputed region of Nagorno-Karabakh since the 1990s. The long-lasting, frozen conflict has resulted in ethnic strife and fundamental hatred on the individual level in the citizens of both Caucasian countries. What shapes this sentiment on a more individual level has received limited attention. This study argues that having democratic values and ideals translates into having a less hostile attitude towards the other nation amongst citizens of Armenia and Azerbaijan — and more so in Armenia than in Azerbaijan. By using the chi-squared test of independence and ordinary least squares (OLS) and logit regressions for both the Armenian and Azerbaijani datasets, this study provides evidence in favor of the suggested mechanism. The findings have both optimistic and pessimistic implications with regard to the potential of reduced individual-level hostility in the future. Future research should improve limitations of data operationalization in an attempt to further test the conclusions of this study. Introduction: What Can “Break the Ice”? Upon becoming Secretary-General of the Communist Party in 1985, Mikhail Gorbachev transformed the Soviet Union. With the launching of a new economic program known as perestroika (restructuring) and a policy called glasnost (openness), the new leader of the USSR set the stage — intentionally or otherwise — for the Armenian-Azerbaijani conflict in 1988. What Gorbachev did by allowing a more open stance on public discourse and loosening the state grasp of the media was, essentially, the unearthing of the decades-long nationalistic feelings in the Caucasus successfully silenced by his predecessors, most notably Stalin. The result was a nationalist movement that kick-started in the Armenian capital Yerevan in 1987 and led to a bloodshed, ongoing as of May 2018. Tracing the roots of the conflict, one must go back to the formation of the Soviet Union. After the Caucasian republics of Armenia and Azerbaijan were Sovietized in 1921, the ‘Treaty of Brotherhood and Friendship’ was signed between the Soviet Union and the newly created Republic of Turkey. The treaty agreed that the Armenian-populated region of Nagorno-Karabakh (then, Nagorno-Karabakh Autonomous Oblast) was to be placed under the control of the Azerbaijani Soviet Socialist Republic (SSR), Turkey’s newly formed sister-country. (Ironically, representatives from neither the Armenian SSR nor the Azerbaijani SSR were involved.) However, the Armenian SSR was not able to counteract Moscow, especially with the beginning of Stalin’s reign who made sure “to divide the Caucasian peoples to prevent unified resistance”. Thus, it was after Mr. Gorbachev’s policies that ultimately gave birth to a war frozen in nature. The conflict is termed “frozen” since, as Gahramanova puts it, “neither the central state nor the international community recognized the secession and there is no agreed political settlement”. On the one hand, Armenians fight for their right of self-determination and territorial integrity, pushing the international community to recognize the region as an independent state or part of the Republic of Armenia. On the other hand, Azerbaijan pushes for territorial integrity from its own perspective, arguing that the Armenians are “latecomers” and that Armenia occupied and is still in illegitimate control of Azerbaijani land after the ceasefire in 1994. The demonstrations of nationalistic sentiment and hatred on the individual level are, however, often taken for granted. Literature on the Armenian-Azerbaijani conflict is focused on the nature of the conflict and is oftentimes approached as a case study for “frozen” conflicts (like, conflicts in Crimea, India and Pakistan, the Koreas, and South Ossetia) from the perspective of warfare and diplomacy. Yet, in a conflict of such accentuated ethnic strife, exploring what constitutes the sentiment towards the other nation on an individual level is equally crucial. Democratic values are among those that can influence one’s attitudes towards another nation. There have been some recent studies on democratic attitudes, one of the most notable being that of Ariely and Davidov which tried to establish a cross-national comparative method of estimating democratic attitudes. Other scholars, Sullivan et al. explore democratic attitudes and tolerance towards certain population groups, like communists and atheists. One aspect that has received relatively less attention is how democracy and having democratic attitudes affects one’s view of a specific ethnic group. That is the matter of this study that argues that, in the context of the Armenian-Azerbaijani conflict, having democratic values makes an individual more accepting of the other nationality. As part of a secondary goal, this study argues that the established framework of democratic-ethnic attitudes holds in the case of Armenia more strongly than in Azerbaijan. Section 2 introduces the theoretical framework and previous research on democratic attitudes, ethnicity-related attitudes, and where the two meet. Section 3 operationalizes the main independent and dependent variables and shows some trends in Armenia and Azerbaijan in 2011-13. Section 4 runs the rigorous statistical analysis based on the χ2 test of independence and ordinary least squares (OLS) and logit regressions for both the Armenian and Azerbaijani datasets. Section 5 concludes. It is also imperative to break down the concept of the so-called “national sentiment” with regard to Armenians or Azerbaijanis by the other nation. Attitudes towards another nation can defined as a stance — “simply a person’s general feeling of favorableness or unfavorableness” — on individuals of certain cultural, national, religious, and/or other identities other than one’s own. The term “national sentiment” is put in quotation marks due to its ambitious generalization trying to ascribe a set sentiment to all members of a nation. However, considering the Caucasian conflict, attitudes towards a nation with which one’s country is involved in active conflict are, indeed, “more national.” As shown later, a large percentage of the population in a country, unsurprisingly, holds a similar — often hostile — opinion on the rival country. There has been growing research on attitudes on immigrants, especially in the context of the European Union and the United States. For instance, Becchetti et al. investigate the effect of household income on attitudes towards immigration in Germany from 1992 to 2004. Mayda explores economic and noneconomic determinants on stance on immigration in the United States up to 2006. However, there is very limited empirically-rigorous literature on what constitutes the stances on a particular nation — let alone a nation in conflict. A Belgian study investigates national attitudes towards foreigners in Flemings and Wallonia, with particular regional findings; while a Canadian research project investigated the attitudes of Canadians towards Native Indians. The latter example can be representative of a study on “national sentiment” on a rival nation in that there used to be conflict between white immigrants and Native Indians; however, it is still not indicative of sentiments during an active, ongoing conflict that has been taking place for more than twenty years. Surprisingly, the merits of democratic culture and attitudes are shown to be under- studied. It is true that the effect of democracy as a regime has been under the attention of many researchers. One study explores the multiple scenarios with regard to the effect of democracy on economic growth and inequality. However, the effect of democratic attitudes and ideals seem to have passed the researchers’ attention. One of the few investigations pursuing that goal is carried out by Hooghe et al. where the researchers scrutinize the effect of democratic attitudes on trust in European democracies. But especially in the context of regional conflicts, democratic attitudes can tell part of the story regarding the individuals’ “feelings” towards the other nationality. Tolerance, fairness, and compromise are among the most important values of the democratic tradition. These values are what produce a culture of “listening” and tolerance with little (if any) consideration of the other individual’s background. This is, of course, an ideal theory which cannot hold completely in practice due to people’s inherent biases and historical-cultural reasons. Nevertheless, with the spread of democratic ideals in the two countries, an individual with democratic values will be as or more likely to sit down at the same table with the representative of the other nationality, ceteris paribus, especially given the heightening conflict and its implications on both nations. This means that the tolerance characterized by the democratic ideals enables individuals to establish relationships with a representative of the other nationality. By consequence, individuals will have less hostile attitudes towards the other nation. A skeptic might argue that Armenia and Azerbaijan are not the most emblematic democracies in the world. However, this study is concerned with neither the regime of the countries nor the regime’s by-products. Instead, it is exploring democratic attitudes on the individual level to get a picture of individual perspectives on ethnic strife. After all, today one can live in a partially democratic or un-democratic state but very well have democratic values due to wider access to travel, television, education, and social media. This study uses the dataset of surveys run by the Caucasus Research Resource Center (CRRC) as part of the “Caucasus Barometer” initiative. Being a face-to-face, paper-and- pencil interview, the survey is about socio-economic issues and political attitudes and was conducted on a representative random sample, with the individual as the unit of analysis. The survey involves both Armenia and Azerbaijan and the data include demographic information and indicators related to democratic values and ethnicity-related attitudes. The time period of 2011-2013 is chosen as the focus of this study because of the absence of Azerbaijani data beyond the year of 2013. This factor is taken into account in the analysis of the data and extrapolation towards more recent years is maximally avoided. It is hypothesized, however, that the conclusions hold for beyond 2013 because, given the Armenian dataset after 2013, democratic attitudes do not change significantly and the attitudes towards the other nationality deteriorated. This is explained by the increased tensions of the so-called “Four-Day War” that broke out in April 2016 when the cease-fire was broken yet again. The challenge of quantifying a concept so broad as ‘democratic attitude’ cannot be emphasized enough. Bearing this in mind, this paper develops two models of measuring attitudes towards democracy with the data available in the CRRC dataset: (1) the self- evaluative indicator model, (2) and the criterion-based indicator model. Democracy is preferable to any other kind of government. In some circumstances, a non-democratic government can be preferred. For someone like me it doesn’t matter. The model (referred later as “Attitudes-SEI”) codes the first option as 1, and the other two as 0, making it a binary variable.1 This is done with the logic that if there is any doubt on the preference of democracy, the response should be coded as a disapproval (= 0). A method similar to the self-evaluative indicator model is used by Ariely and Davidov  in their investigation. Possible answers (after recoding): approve (= 1) includes values 1 and 2, disap- prove (= 0) includes values 3 and 4. Recoded, used to be an ordinal variable from 1 (“not important at all”) to 10 (“extremely important”). Possible answers (after recoding): approve (= 1) includes values greater than 8, disapprove (= 0) includes values less than or equal to 8. The index is calculated by computing the arithmetic mean of the three variables, giving the possibility of the following answers: 0, 0. (3), 0. (6), 1. According to the criterion-based model, individuals that have a higher index have a stronger approval of democracy and democratic attitudes. The criterion-based indicator model is a rather novel way of approaching attitudes towards democracy. Like democratic attitudes, operationalizing attitudes towards a nation poses definitional problems. Given the constraints of the survey data, this investigation considers the attitudes towards establishing economic and familial relationships with the other nationality. The value of considering these two kinds of relationships is that they offer different levels of relationships with the individual. It is logical to assume that in the case of the Armenian-Azerbaijani relations individuals will be more likely to be more open to establishing economic relationships (e.g. doing business, working in the same company) than familial relationships (e.g. marriage), which is confirmed by the survey results. Both variables are binary, with approval (= 1) and disapproval (= 0). The index is calculated by taking the sum of the two variables, giving the possibility of the following answers: 0, 1, 2. According to this index, individuals that have a higher index have a less hostile sentiment towards representatives of the other nation. It should be mentioned outright that a significant limitation of using these indicators is the extreme lack of variation of the dependent variable. This is especially true with regard to approval of marriage since, say, in 2013, only 4% of Armenians and only 1% of Azerbaijanis approved women to marry the representative of the other nationality.3 However, given the constraints and values of the data, the study uses these indicators with caution. After all, how much do they “hate” each other? Considering the 2011-13 data, the frozen conflict has had a toll on the peoples’ attitudes towards the rival nation. Figure 1 shows the attitudes of the respondents towards representatives of the other nation, according to the index created in the previous subsection based on approval of establishing economic and familial relationships. The figure shows the sample mean of the index in the years 2011-2013. Based on the bar plot on the left, it is apparent that the attitudes of Armenians towards the Azerbaijani are quite hostile and have been becoming more so throughout the years, with the index reaching as low as approximately 0.26 (out of 2). The Armenian respondents might seem surprising in terms of their hostility towards their neighbors. However, the Azerbaijani hostility is shown to be ten-fold as severe. The plot on the right of Figure 1 is the same graph as the previous one, with the Azerbaijani responses. Notice the scale on the y-axis: the maximum value on the axis in Armenian dataset is ten times as much as the one in the Azerbaijani dataset. These are extreme results. Having 0.008 (out of 2) as the greatest index in 2013 is an indication of the overwhelming majority of the people that were coded 0 on both of the two variables that comprise the index, highlighting the extreme hostility from the Azerbaijani side. has a lot more respondents that have a positive (= 2) or “average” (= 1) attitude. By contrast, one could literally count on the plot the number of the Azerbaijani respondents that expressed a slightly positive attitude towards their neighbors. Figure 2, in fact, has another interesting story to tell. Considering the focus of this study, i.e. the relationship between attitudes towards democracy and the other nation, the figure highlights the correlation. There is preliminary suggestion that attitudes towards democracy covary positively with higher attitudes towards the other nation, given the lines of best fit. Although they do not have a very pronounced slope, especially in the case of the Azerbaijani dataset due to lack of variation in the responses, the rigorous statistical tests in the following section confirm the existence of the relationship. In order to rigorously test the hypothesis of this study, two methods are used: (1) the χ2 test of independence, (2) and ordinary least squares (OLS) and logit regressions. Null Hypothesis (H0): Attitudes towards democracy and attitudes towards the other nation are independent. Alternative Hypothesis (Ha): Attitudes towards democracy and attitudes towards the other nation are not independent. There is an association. 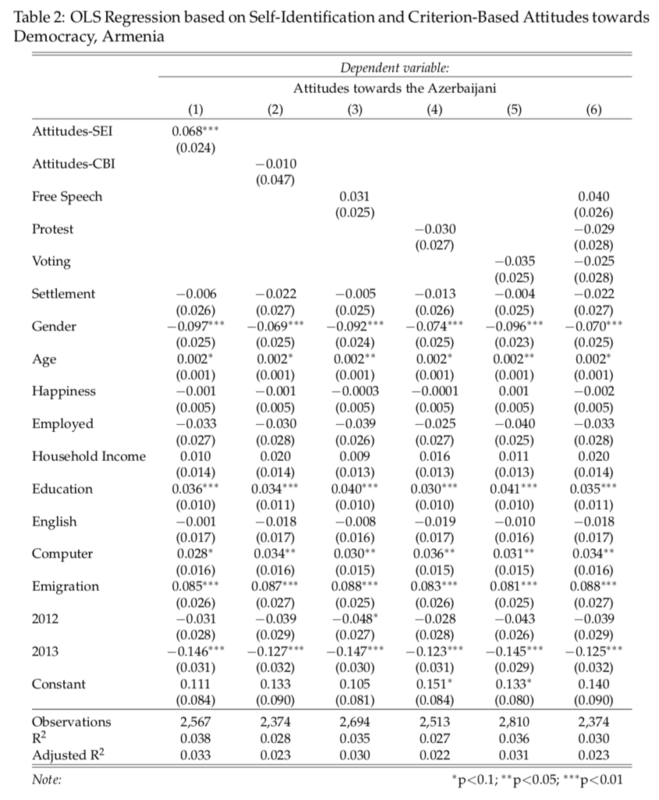 Table 1 shows the p-values of the test performed on all models of attitudes towards democracy in Armenia and Azerbaijan. The only result that is statistically significant at the 95% confidence level, rejecting the null hypothesis, is the self-evaluative indicator model in Armenia. This suggests that the relationship between the two central variables mostly holds according to the study’s theory in Armenia. By contrast, it is shown to not hold in Azerbaijan, which could be due to lack of variation in the attitudes towards Armenians. Settlement: Living in rural regions (coded as 0) may result in more hostile attitudes towards the other nation and democracy due to the preservation of cultural traditions. Gender: Being a male (coded as 0) may result in more hostile attitudes because of more direct association with the other nation through the army and due to stronger conservative ideology. Age: Being young may result in a less hostile attitude due to more tolerant views. Happiness: Being happy (coded as 1) may result in a much more optimistic attitude towards democracy and the other nation. Employed: Being employed (coded as 1) may result in higher intelligence and favoring of dialogue, resulting in less hostile attitudes. Household Income: The same argument as being employed can be used. English: Knowledge of English (coded 1-4) may result in higher exposure to interna- tional media and information, potentially resulting in more liberal and progressive views and, hence, hostile attitudes. Computer: The same argument as knowledge of English can be used. Emigration: Tendency to emigrate may result in less hostility because one would not care as deeply about the other nation. Year: Dummies for 2012 and 2013 are added to fix year effects. Tables 2 and 3 show the results of the OLS regressions for Armenia and Azerbaijan respectively. In each table, Model 1 focuses on Attitudes-SEI, while Model 2 on Attitudes- CBI. In addition, Models 3, 4, and 5 focus on the individual components of Attitudes-CBI – free speech, protests, and voting respectively. Model 6 includes all three components of Attitudes-CBI. Among the coefficients of interest, only Model 1 is statistically significant in both regressions, although more significant in Armenia than Azerbaijan. Figure 3 shows the coefficients with their 95% confidence intervals for Models 1 and 2. It is apparent that in the first model, the coefficients of both Armenia and Azerbaijan are significant on some level since they do not cross the x-axis. The fact that the rest of the Models did not produce statistically significant results is because of the flaws of the criterion-based indicator model. The latter is not absolutely exhaustive since it does not include all characteristic strands of a respondent that has democratic values; this warrants the development of a more comprehensive and holistic criterion-based measure by future researchers. Nevertheless, when the Armenian and Azerbaijani datasets are run together, the criterion-based model produces significant, positive results. This, combined with the significant results in Model 1, provides support for the argument of the study that having democratic views results in having less hostile attitudes towards the neighboring nation. The argument is also somewhat solidified by the logit models that take the components of the attitudes towards the other nation as individual dependent variables. That is to say, the two models of democratic attitudes are also run by a logit model with the dependent variables of having business and marrying the other nationality variables individually. 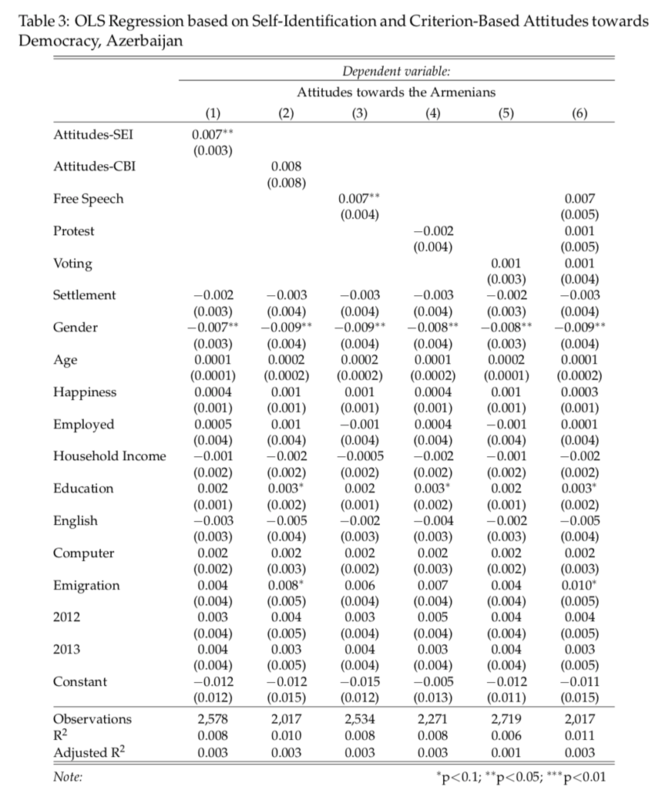 Doing business in Armenia in Attitudes-SEI proved to be highly significant. The marriage models did not produce any significant outcomes likely because of lack of variation in the willingness to marry a representative of the other nationality. Figure 3 also shows the other theme undertaken by the study – that is, which of the neighboring countries adheres by the hypothesis of the paper more. One can see in the first model that the confidence intervals do not overlap, which means that the coefficients are statistically significantly different from each other. In addition, the coefficients in the Armenian dataset are much higher than those of Azerbaijan in the self-evaluative indicator model, highlighting that having democratic attitudes is tied to having less hostile views of the other nation more in Armenia than in Azerbaijan. Part of the reason this is the extreme homogeneity of responses that make up the attitudes towards the Armenians in the Azerbaijani dataset. This, in turn, could be explained in part by the relatively more extreme dictatorial rule in Azerbaijan by Ilham Aliyev who runs a massive anti-Armenian propaganda machine. The Armenian-Azerbaijani conflict is still very much a pivotal issue in the region. On the state level, a great proportion of the government expenditure of both countries is allocated to the military, while investors are scared off by the political and economic instability of the region, especially Armenia. On the individual level, citizens that identify with their ethnicity often tend to have extremely hostile attitudes towards their neighbor. This trend has been deteriorating in the recent years, especially around 2016 with the renewed armed conflict, filling the Caucasian highlands with an atmosphere of hatred and intolerance. Does the “Caucasian Tragedy” have a remedy? The primary goal of this study was to analyze the relationship between having democratic values and ideals and attitudes towards the rival nation in Armenia and Azerbaijan. As a secondary goal, it explored which country fits with the established mechanism of the paper and which one more. The very limited evidence used serves as a very strong ground for the established mechanism of the paper — that individuals with democratic ideals that are used to the culture of dialogue and tolerance are more ready to form relationships with the representative of the other nationality. The χ2 test of independence and the OLS and logit regressions serve as the basis of this conclusion. It is true that the χ2 test did not produce significant results for Azerbaijan; most of the models in the OLS and logit regressions were not statistically significant either. However, that addresses the secondary goal of this research project; in fact, the predominant insignificance of the Azerbaijan results show that the linear association between the variables is very weak/nonexistent, showing that the mechanism operates less strongly in Azerbaijan that in Armenia. This comes to suggest that being Armenian or Azerbaijani is an antecedent variable that explains variations in attitudes towards the other nation. The implications of this study are far-reaching. Today, democratic culture transcends borders, especially targeting the highly progressive youth. Could democracy be the cure to the wounds of the Caucasian conflict? The answer is two-fold and complicates the matter instead of simplifying it. Optimistically, the ethnic confrontation might be mitigated by increased democratic culture, given the findings that suggest that there is a relationship between democratic values and decreased hostility towards the rival nation. In fact, just recently in April 2018, the Armenians peacefully protested against the elected Prime Minister who wanted to prolong his reign. 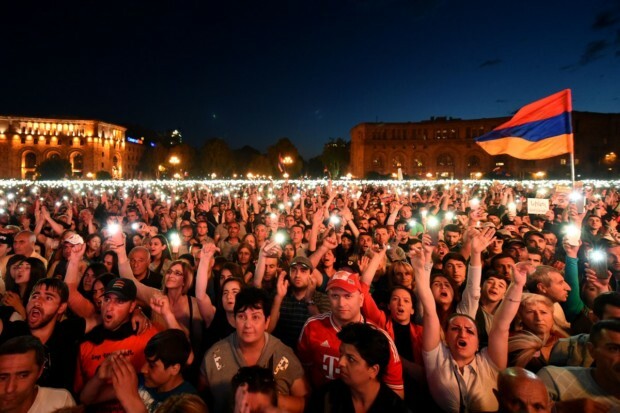 The result was a peaceful, so-called “Velvet Revolution” that resulted in the transition of power to the opposition leader Nikol Pashinyan with no bullets shot. This is, by all means, a manifestation of democratic culture and exercising of rights that could suggest renewed attitudes towards the Azerbaijani in Armenia. Pessimistically, there might be an unbalance between the attitudes towards their rival nation in Armenia and Azerbaijan. This study showed that the mechanism established works well with the Armenian respondents and less so with the Azerbaijani. Therefore, external factors — like the state-wide, anti-Armenian propaganda advanced by the Azerbaijani dictator — make even those that hold democratic values in Azerbaijan have negative views towards Armenians. This means that so far as the strong dictatorship is in place in Azerbaijan, even with a popular democratic movement, the attitudes towards the Armenians are unlikely to be ameliorated so easily. Icek Ajzen and Martin Fishbein. Understanding attitudes and predicting social behavior. Prentice-Hall, 1980. ISBN 978-0-13-936443-3. Google-Books-ID: AnNqAAAAMAAJ. Gal Ariely and Eldad Davidov. Can we Rate Public Support for Democracy in a Compara- ble Way? Cross-National Equivalence of Democratic Attitudes in the World Value Survey. Social Indicators Research, 104(2):271–286, November 2011. ISSN 0303-8300, 1573-0921. doi: 10.1007/s11205-010-9693-5. URL http://link.springer.com/10.1007/s11205-010-9693-5. Leonardo Becchetti, Fiammetta Rossetti, and Stefano Castriota. Real household income and attitude toward immigrants: an empirical analysis. The Journal of Socio-Economics, 39(1):81–88, January 2010. ISSN 10535357. doi: 10.1016/j.socec.2009.07.012. URL http://linkinghub.elsevier.com/retrieve/pii/S1053535709001012. Jaak Billiet, Bart Maddens, and Roeland Beerten. National Identity and Attitude toward Foreigners in a Multinational State: A Replication. Political Psychology, 24(2):241–257, 2003. ISSN 0162-895X. URL http://www.jstor.org/stable/3792350. Svante E Cornell. The Nagorno-Karabakh Conflict. page 164. Michael P. Croissant. The Armenia-Azerbaijan Conflict: Causes and Implications. Greenwood Publishing Group, 1998. ISBN 978-0-275-96241-8. Google-Books-ID: ZeP7OZZswtcC. Robert A. Dahl. Polyarchy : Participation and Opposition. Yale University Press, 1973. ISBN 978-0-300-15357-6. Google-Books-ID: JcKz2249PQcC. Robert A. Dahl. On Democracy. Yale University Press, October 2008. ISBN 978-0-300-23332-2. P. L. Dash. Nationalities Problem in USSR: Discord over Nagorno-Karabakh. Economic and Political Weekly, 24(2):72–74, 1989. ISSN 0012-9976. URL http://www.jstor.org/stable/ 4394241. Aytan Gahramanova. Peace strategies in “frozen” ethno- territorial conflicts: integrating reconciliation into conflict management. page 57. Marc Hooghe, Sofie Marien, and Jennifer Oser. Great expectations: the effect of democratic ideals on political trust in European democracies. Contemporary Politics, 23(2):214– 230, April 2017. ISSN 1356-9775. doi: 10.1080/13569775.2016.1210875. URL https://doi.org/10.1080/13569775.2016.1210875. David Ignatius. Karabakh : A renewed conflict in the Caucasus. Washington Post, April 2016. ISSN 0190-8286. URL https://www. washingtonpost.com/opinions/a-renewed-conflict-in-the-caucasus/2016/04/ 26/e6c2c344-0bec-11e6-a6b6-2e6de3695b0e_story.html. Anna Maria Mayda. Who Is Against Immigration? A Cross-Country Investigation of Individual Attitudes toward Immigrants. Review of Economics and Statistics, 88(3):510– 530, August 2006. ISSN 0034-6535, 1530-9142. doi: 10.1162/rest.88.3.510. URL http://www.mitpressjournals.org/doi/10.1162/rest.88.3.510. Martha L. McCoy and Patrick L. Scully. Deliberative Dialogue to Expand Civic Engagement: What Kind of Talk Does Democracy Need? National Civic Review, 91(2):117–135, 2002. ISSN 0027-9013, 1542-7811. doi: 10.1002/ncr.91202. URL http://doi.wiley.com/10.1002/ ncr.91202. Carol Migdalovitz. Armenia-Azerbaijan Conflict. page 20. OSCE. Anti – Armenian propaganda and hate dissemination carried out by Azerbaijan as a serious obstacle to the negotiation process. Technical report, OSCE, 2008. URL https://www.osce.org/odihr/34195?download=true. J. Rick Ponting. Conflict and Change in Indian/Non-Indian Relations in Canada: Com- parison of 1976 and 1979 National Attitude Surveys. The Canadian Journal of Sociology / Cahiers canadiens de sociologie, 9(2):137–158, 1984. ISSN 0318-6431. doi: 10.2307/3340211. URL http://www.jstor.org/stable/3340211. David Rieff. Case Study in Ethnic Strife. Foreign Affairs, 76(2):118–132, 1997. ISSN 0015-7120. doi: 10.2307/20047941. URL http://www.jstor.org/stable/20047941. Michael J. Sodaro. Comparative politics: A global introduction. McGraw-Hill Companies, 2004. John L. Sullivan, James Piereson, and George E. Marcus. Political Tolerance and American Democracy. University of Chicago Press, May 1993. ISBN 978-0-226-77992-8. Ralph Turner. The Construction of a Democratic Culture. Social Science, 17(3):285–293, 1942. ISSN 0037-7848. URL http://www.jstor.org/stable/41885715. Arto Vaun. Armenia’s ‘Velvet Revolution:’ A masterclass in socialism. https://www.aljazeera.com/indepth/opinion/ armenia-velvet-revolution-masterclass-socialism-180507093619273.html. Michael P. Croissant, The Armenia-Azerbaijan Conflict: Causes and Implications (Greenwood Publishing Group, 1998). Svante E Cornell, “The Nagorno-Karabakh Conflict,” n.d., 164. Aytan Gahramanova, “Peace Strategies in ‘Frozen’ Ethno- Territorial Conflicts: Integrating Reconciliation into Conflict Management,” n.d., 57. Carol Migdalovitz, “Armenia-Azerbaijan Conflict,” n.d., 20. P. L. Dash, “Nationalities Problem in USSR: Discord over Nagorno-Karabakh,” Economic and Political Weekly 24, no. 2 (1989): 72–74. David Rieff, “Case Study in Ethnic Strife,” Foreign Affairs 76, no. 2 (1997): 118–32, https://doi.org/10.2307/20047941. Gal Ariely and Eldad Davidov, “Can We Rate Public Support for Democracy in a Comparable Way? Cross-National Equivalence of Democratic Attitudes in the World Value Survey,” Social Indicators Research 104, no. 2 (November 2011): 271–86, https://doi.org/10.1007/s11205-010-9693-5. John L. Sullivan, James Piereson, and George E. Marcus, Political Tolerance and American Democracy (University of Chicago Press, 1993). Robert A. Dahl, Polyarchy : Participation and Opposition (Yale University Press, 1973). Robert A. Dahl, On Democracy (Yale University Press, 2008). Ralph Turner, “The Construction of a Democratic Culture,” Social Science 17, no. 3 (1942): 285–93. Martha L. McCoy and Patrick L. Scully, “Deliberative Dialogue to Expand Civic Engagement: What Kind of Talk Does Democracy Need?,” National Civic Review 91, no. 2 (2002): 117–35, https://doi.org/10.1002/ncr.91202. Daniel Yankelovich, The Magic of Dialogue: Transforming Conflict Into Cooperation (Simon and Schuster, 2001). Philippe C. Schmitter and Terry Lynn Karl, “What Democracy Is. . . and Is Not,” Journal of Democracy 2, no. 3 (1991): 75–88, https://doi.org/10.1353/jod.1991.0033. Icek Ajzen and Martin Fishbein, Understanding Attitudes and Predicting Social Behavior (Prentice-Hall, 1980). Leonardo Becchetti, Fiammetta Rossetti, and Stefano Castriota, “Real Household Income and Attitude toward Immigrants: An Empirical Analysis,” The Journal of Socio-Economics 39, no. 1 (January 2010): 81–88, https://doi.org/10.1016/j.socec.2009.07.012. Anna Maria Mayda, “Who Is Against Immigration? A Cross-Country Investigation of Individual Attitudes toward Immigrants,” Review of Economics and Statistics 88, no. 3 (August 2006): 510–30, https://doi.org/10.1162/rest.88.3.510. Jaak Billiet, Bart Maddens, and Roeland Beerten, “National Identity and Attitude toward Foreigners in a Multinational State: A Replication,” Political Psychology 24, no. 2 (2003): 241–57. J. Rick Ponting, “Conflict and Change in Indian/Non-Indian Relations in Canada: Comparison of 1976 and 1979 National Attitude Surveys,” The Canadian Journal of Sociology / Cahiers Canadiens de Sociologie 9, no. 2 (1984): 137–58, https://doi.org/10.2307/3340211. Michael J. Sodaro, Comparative Politics: A Global Introduction (McGraw-Hill Companies, 2004). Marc Hooghe, Sofie Marien, and Jennifer Oser, “Great Expectations: The Effect of Democratic Ideals on Political Trust in European Democracies,” Contemporary Politics 23, no. 2 (April 3, 2017): 214–30, https://doi.org/10.1080/13569775.2016.1210875. Sodaro, Comparative Politics: A Global Introduction. David Ignatius, “Karabakh : A Renewed Conflict in the Caucasus,” Washington Post, April 26, 2016, sec. Opinions, https://www.washingtonpost.com/opinions/a-renewed-conflict-in-the-caucasus/2016/04/26/e6c2c344-0bec-11e6-a6b6-2e6de3695b0e_story.html. All missing values were due to random error and are, hence, eliminated from the data analysis. By doing so, the study assumes that going from an answer of “0” to “0. (3)” has the same effect as, say, going from “0. (6)” to “1”. In order to mitigate this issue, the individual criteria (first separately, then combined) are used to run the models later on. It is worth noting that this pattern is not observed with attitudes towards other nationalities. That is, both Armenians and Azerbaijanis were significantly more willing to do business or have women marry foreign nationals (other than Azerbaijanis or Armenians respectively). Thus, the possibility that the nations are against having relations with foreigners in general is ruled out. Attitudes-SEI is used but the other models would also be suitable. OSCE, “Anti – Armenian Propaganda and Hate Dissemination Carried out by Azerbaijan as a Serious Obstacle to the Negotiation Process” (OSCE, 2008), https://www.osce.org/odihr/34195?download=true. Arto Vaun, “Armenia’s ‘Velvet Revolution’: A Masterclass in Socialism,” accessed May 11, 2018, https://www.aljazeera.com/indepth/opinion/armenia-velvet-revolution-masterclass-socialism-180507093619273.html.